Planning a summer party? Then look no further than these show-stopping watermelon vodka jelly shots! 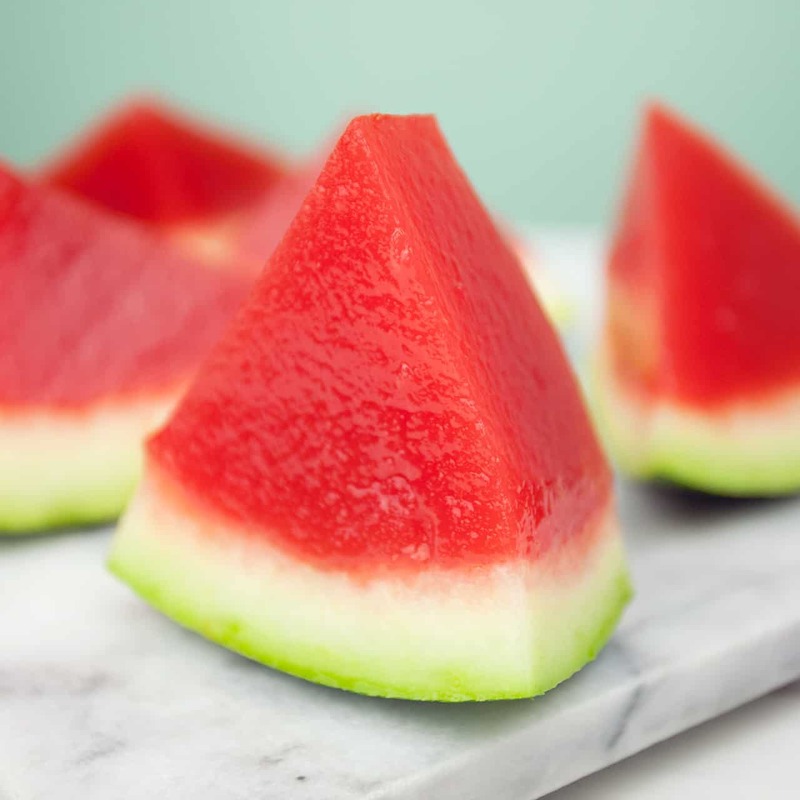 This recipe uses only half of the watermelon to make the jelly shots – we simply cut the remaining half into slices to eat. But if you’re hosting a big party, just double the ingredients to fill both watermelon halves. We’ve tested these watermelon jelly shots over-and-over again (and yes, we had quite a lot of fun doing so!) and we discovered it’s really important to dry out the inside of the watermelon. This helps the jelly stick to the rind. But try freezing the shots for longer if your jelly is still slipping. Take 1/2 a watermelon and scoop out all of the flesh, removing the seeds as you go. Once all the flesh is removed, place kitchen towels inside the watermelon half to soak up the remaining moisture. The inside of the watermelon will need to be as dry as possible. Place all the watermelon flesh in a blender and blend until smooth. You may need to repeat this step if you have a small blender. Strain all of the watermelon juice through a sieve, discarding any pulp that is left in the strainer. Measure 300ml of the strained watermelon juice and transfer to a saucepan on a medium heat. Add the sugar and agar flakes, and leave to simmer. Only stir the mix once all the agar flakes have dissolved. Then leave to simmer for a further 2-3 minutes. Measure another 500ml of the strained watermelon juice and combine it with the mixture from the saucepan. Stir in the vodka and pour the mixture into the watermelon half. Tip: mix any leftover watermelon juice with lemonade to make a delicious drink. Leave the watermelon half on a kitchen counter to cool, then transfer to a freezer for 3 hours. 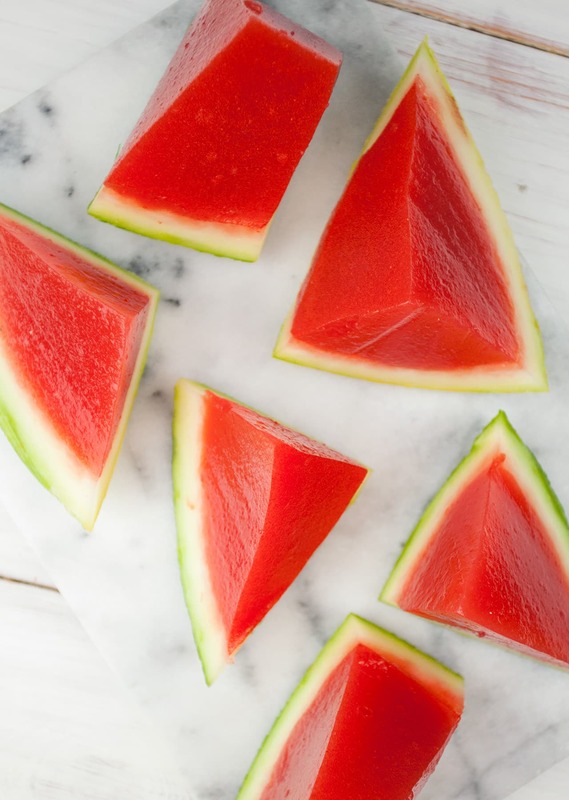 Remove the watermelon from the freezer and cut into chunky triangular wedges, trimming any edges. It’s important you cut the watermelon in triangular shapes to prevent the jelly from slipping off the rind. If the jelly starts to come away from the rind, place the watermelon back in the freezer. have you tried it without sugar or maybe a healthier sweetener like maple syrup?